Lapse 2: Before Zero – Do you want to run a kingdom yourself? If you are confident with controlling many factors to balance a country, then Lapse’s banana game will be one of the most attractive choices for you. Moreover, this product does not follow the simulations of simulation games but is a card game. Its ways of playing are so special that it cannot be used to describe all of its meanings from cards. To make it easier for you to imagine, its play is the same as Tinder’s dating app. The first introduction to this series of games, it is the official next version of Lapse: A Forgotten Future game. This means that this product will retain everything the test version of the previous version does not currently change a bit, but this time will change the context only. If you continue to come to this world, you must have succeeded in protecting the world in the previous version or destroying it. But don’t worry too much because if you are here means you have passion, only that is enough. 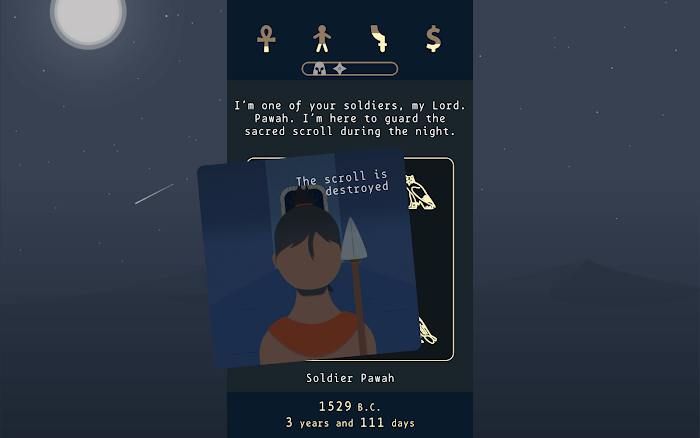 This time the player will be taken to the world of ancient Egypt. Don’t worry too much about becoming a future time traveler and teleporting back to the ancient world and destroying all — the stuff of the timeline. It will exist a separate timeline, and you can freely record your own history. For example, the last time you were a talented president, now would be Pharaon, the king of Egypt. As for the robots coming from the future to help you in the hard work of the previous game, now they become powerful servants or the most trusted allies. The game will bring many answers that they still have questions if they went through part 1 of the game. When you first enter this game, you will make an unconscious and wake up with an urgent voice. And after you wake up after a long time, you have gone to another era of humanity. 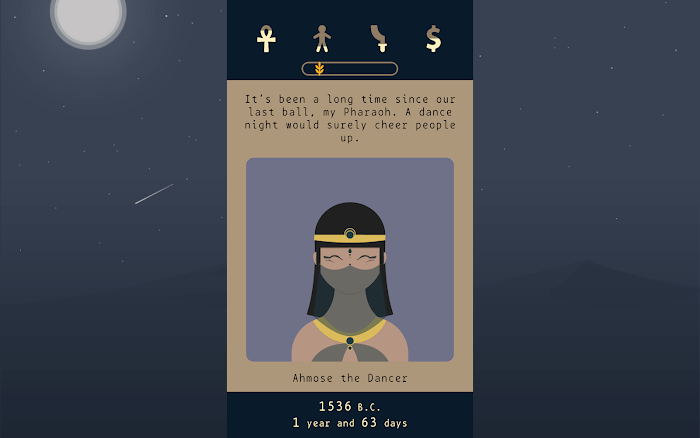 When you open your eyes, the game began at 1750 BC, in the context of ancient Egypt. For some reason this country needs your help, they need the wisdom and wisdom of a mighty king. 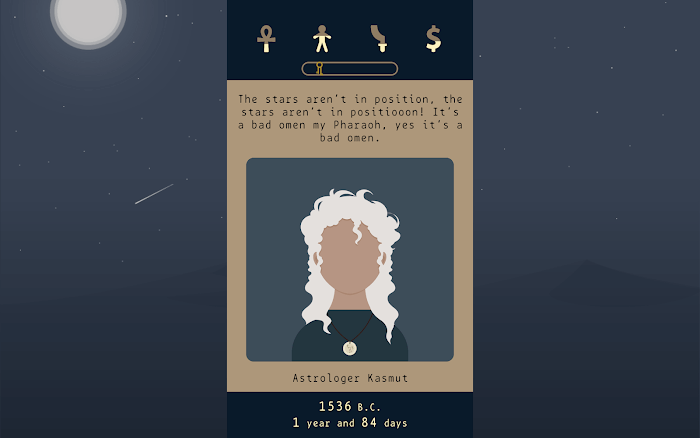 As I mentioned above, the gameplay of the game will be like a dating app Tinder. 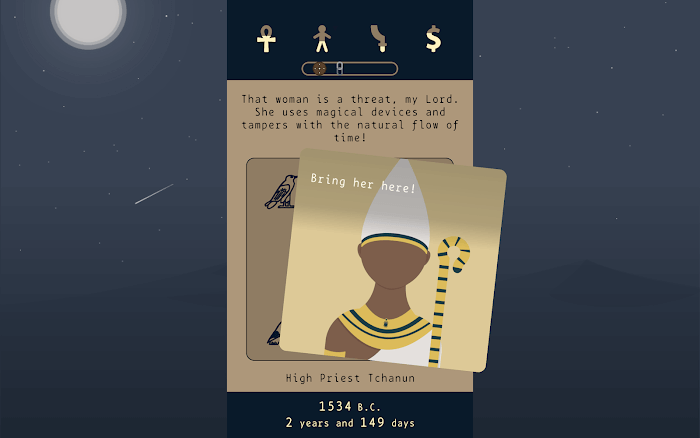 This means that the game offers a variety of Cards and each Card represents a person presenting in front of Pharaoh. It could be a Dancer, High Priest or Astrologer, … These people will bring different news based on their own responsibilities. If the person who took the position to bring the entertainment, he advised the king to make the people happy, the officials would bring wise advice and prophets to deliver the message of the gods. Players must find a way to balance four elements: Religion, Population, Money, and War. We must always be in a balanced position; the country will continue to operate. If they are misaligned, the state will inevitably fall into chaos, and the future will continue to collapse. Below will appear a line of time that you maintain your throne, try to stretch it as long as possible that you have achieved your own success.